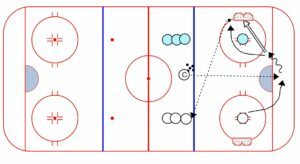 Try using hockey small area games drills to simulate various game situations your players will encounter. This one helps to reenforce shooting and crashing the net for rebounds, as well as odd man play and battles. As always, click here for the printout. 2. dumps puck in for a 1 on 1 battle. 3. As soon as a player gets a shot on net, another man from his team may be activated. 4. Player must pass back to next man in line in order to activate the player. 5. Activate up to 3 players – play continues until a goal is scored. Variation: Try this full ice — start with 3 on 3 then activate up to 5 players.